Spring has come to the water-efficient landscape (WEL) demonstration garden at the Fair Oaks Horticulture Center. Open to the public seven days a week wheelchair accessible, the gardens feature natives, commonly available perennials, trees, shrubs, and plants from other Mediterranean climates that do well with less water during our long, hot, dry summers and tolerate our chilly, damp Sacramento County winters. Most plants are labeled and many are UC Davis Arboretum All-Stars. Master Gardeners will be in the garden with tips and information at the March 9 Saturday morning Open Garden, from 9 AM to Noon. Learn about selecting and planting woody ornamentals during our mid-morning mini-demonstration and using the Water Use Classification of Landscape Species (WUCOLS) criteria to make water smart plant choices. See more information about our Open Garden. Deep blue and brilliant yellow blooms amid fresh green buds and foliage are attracting cruising bees and other beneficial insects under the watchful eyes and noisy chirping of scrub jays and hummingbirds. Especially lovely now are the blue shaded blooms of ‘Mozart’ and ‘Tuscan Blue’ rosemaries and salvias with charming names such as ‘Bees Bliss’, ‘Whirly Blue’, ‘Winnifred Gilman’ and ‘Dara’s Choice’. Yellow blooming standouts are the native Oregon holly grape, daffodils and narcissus, and yellow green euphorbia flower stalks. 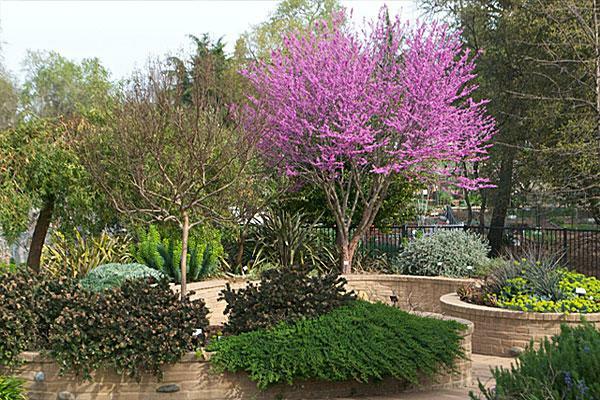 Pink redbud blooms, Butterfly roses ( Rosa x odorata ‘Mutabilis’ ) and California poppies add brilliant accents throughout the landscape. See pictures below. Garden chores this month include weeding out newly germinating annual weeds such as bedstraw, cut leaf geranium and oxalis before they set seed and pulling up oak and other tree sprouts. Here is a good resource for identifying and controlling weeds. Also, now that the danger of frost is past, we will remove dead twigs from winter deciduous perennials such as the bluebeard, lantana, Russian and Mexican bush sages and tidy up many of the other evergreen shrubs, sages and salvias. In addition to the plants, pathways, patios, raised planters, drip irrigation, a dry creek bed and permeable pavement, the garden demonstrates water wise, sustainable alternatives for gardeners who are considering replacing or reducing their lawns. See also the listed tips and resources for gardening with limited water. This sturdy, evergreen, large (over 10 feet tall) shrub with mahogany bark and late winter/early spring clustered white blossoms makes a lovely companion to our other manzanitas, salvias, ceanothus and other natives in our garden. This shrub does well in many conditions in Sacramento by tolerating richer, heavier soils and occassional summer watering. It makes a good accent plant or screening hedge. 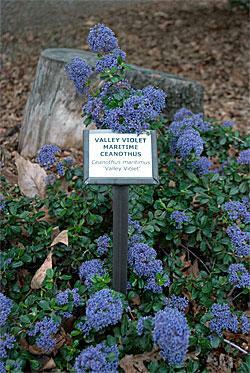 The UC Davis Arboretum calls this low growing California native evergreen shrub “the best small ceanothus for central valley gardens.” A showstopper in winter gardens with spectacular clusters of dark-violet flowers from February to early spring that attract beneficial insects and butterflies, ‘Valley Violet' is a good choice as a groundcover for sunny and partially shady areas. Once established (which may take 2 to 3 years), it requires very little water and pruning. 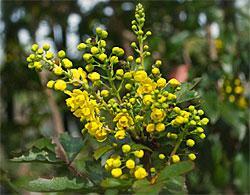 Tolerant of many soil types, it also is wind resistant, and heat and cold tolerant. Although we have several plants throughout the garden, it is especially lovely at the top of the perennial pathway near the scarlet oak on the edge of our native garden area (where it gets very little summer water). 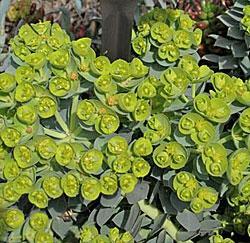 Evergreen perennials that are drought, heat and cold tolerant. They love sun and well-drained soil and will be short lived if watered too much in their later years. Plants make quite a statement in the early spring landscape where the bloom can last 2 to 3 months. Size varies by variety. Donkey-tail is a ground cover reaching 12 to 18 inches high by 4 feet wide. Tasmanian Tiger makes a compact 3 feet tall by 3 feet wide shrub and ssp wulfenii grows about 3 to 5 feet high and wide. Flowers make long lasting additions to arrangements. Dip cut stems in boiling water before use as a cut flower. Prune flower stems to the ground after blooms fade to stimulate new growth from the plant base. Some varieties (ssp wulfenii and myrsinites) reseed freely. 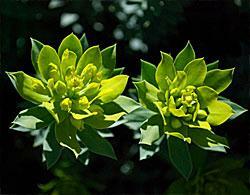 Warning: All Euphorbias have a milky sap that can irritate skin, and is toxic if ingested. Gloves should always be worn while pruning. Care should be taken in locating these plants where young children are present. 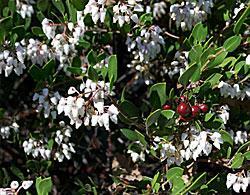 The ‘Compacta’ variety of this evergreen native shrub is another UC Davis All-Star. Brilliant yellow spring blossoms mature into lovely dark purple grape-like clusters that provide food for native birds in the fall. Preferring part shade/ to shade it is a welcome addition to the garden both as an easy care plant and for it’s value in attracting beneficial insects and wildlife. UC Davis Arboretum All Star. 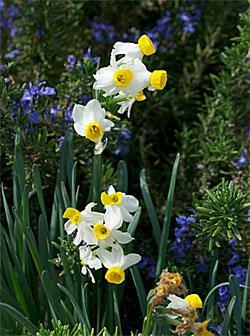 This miniature, multi flowering, fragrant, species narcissus first introduced by the British in 1915 is easy to grow, naturalizes well and makes a lovely spring statement along the front edge of a garden bed. The Butterfly rose is a large shrub rose that's a UC Davis Arboretum All-Star for good reason. First noted by European botanists in 1896, it likely originated in China. 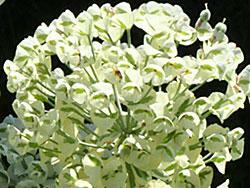 It blooms nearly year round and attracts bees and other beneficial insects. It does well with less water, and tolerates our soils. Although this rose can tolerate some shade, it does not do well in windy sites. Attractive blooms begin as scarlet buds and mutate progressively into light yellow, then pink, then crimson blossoms (that some have likened to butterflies). Newly sprouted canes are deep red, complementing the flowers and the lush foliage. 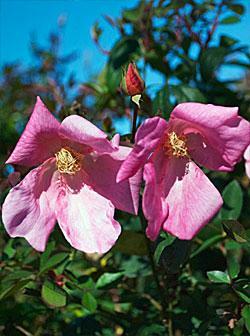 Nearly maintenance free, Mutabilis can be pruned in winter to keep the plant more compact. 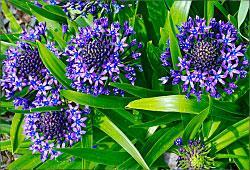 This summer-dormant bulb with enchanting, long lasting spring blooms that attract bees is a native of the Iberian peninsula, Italy and North Africa, not Peru. (Carolus Linnaeus in 1753 was mislead by the name of the ship, Peru, which delivered original specimens to him to name.) It requires sun, good drainage and little summer water, and will naturalize.